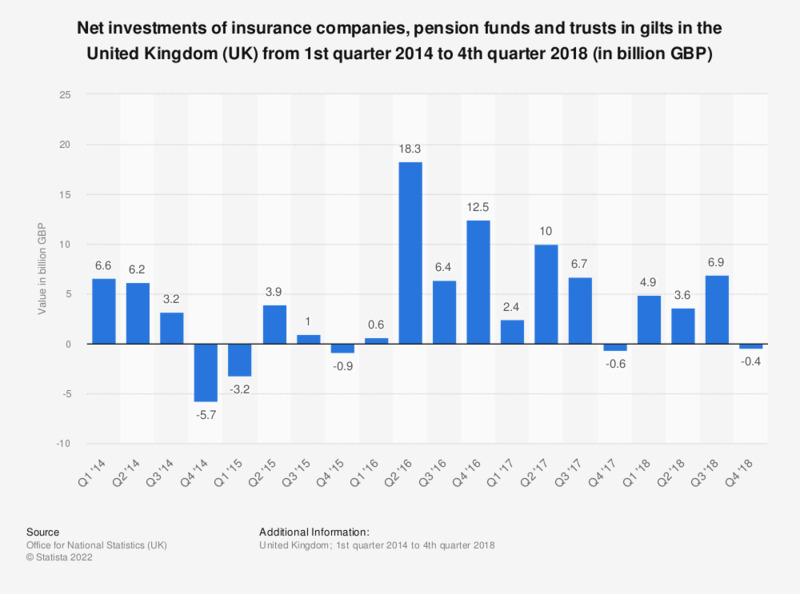 This statistic illustrates the quarterly net value of investments in gilts made by insurance companies, pension funds and trusts in the United Kingdom (UK) from the first quarter of 2014 to the second quarter of 2018. It can be seen that the net investments of insurance companies, pension funds and trusts in gilts fluctuated overall during the period under observation, reaching a value of 400 million British pounds as of the second quarter of 2018. The largest value of investments in gilts was found in the second quarter of 2016, when investments of 18.3 billion British pounds were recorded. Gilts are the UK government sterling securities.